The cover from one of the many excellent elementary science books authored by Jeannie Fulbright. Her name is magnified so you can see it clearly. It has been a while since I have been able to blog, because I have been busy speaking at homeschooling conventions. This past weekend, for example, I spoke at the MassHope convention in Worcester, Massachusetts. I haven’t been at that convention for several years, and it was great to be back! It is an excellent event, with lots of great speakers and a fine facility. Me: They are my elementary science courses. Mother: But they aren’t from Apologia. Mother: But you wrote the Apologia books. Me: Apologia publishes most of my junior high and high school courses, but Berean Builders publishes my elementary courses and my high school chemistry course. I did not write the Apologia elementary courses. Mother: Of course you did. Me: No, I did not. They were written by Jeannie Fulbright. Mother: (still a bit confused) We use the Apologia elementary books, and I thought you wrote them. Me: No, Jeannie Fulbright wrote them. She and I have similar writing styles, but she wrote the Apologia elementary courses. To some extent, I understand the confusion. My wife and I started Apologia with my high school science courses. As a result, my name became strongly associated with the company. Eventually, however, it started publishing the works of other authors, including Jeannie Fulbright’s excellent elementary courses. Her name has always been on the cover (shown above), spine, and title page of each of her books. When I was still with Apologia, it at least made sense that people who had never used her books would think that I had written them, since I was still the “face” of the company. However, my wife and I sold the business in 2008. I had planned to stay with the company for ten years, but I quit after only two. So it has been more than 8 years since I have worked for Apologia. Nevertheless, despite the fact that I do not work for Apologia, and despite the fact that Jeannie Fulbright’s name is on all its elementary books, people still seem to think that I have written them. That is simply not true. I did edit most of her books, but that is all. The books are a result of Jeannie Fulbright’s hard work and obvious talent. Now please understand why I am writing this. It’s not because I dislike her books. In fact, I think that her elementary science books are excellent. She has a way of explaining scientific truths that is easy to understand and enthusiastic. Many children throughout the years have told me how much they enjoy her books, and I can see why. Because her books are so good, it is wrong for me to get credit for them. She should get the credit that she so richly deserves. Well, if her books are so great, why would I write my own series of elementary courses? Because like most curricula, her books suit one kind of student very well, but there are other kinds of students. I wrote my books to meet the needs of at least some of those students. So her books are not better than my books, and my books are not better than her books. Our books are different, and they are both excellent – for different kinds of students. How do these two sets of books meet the needs of different students? First, her books are topical. The book pictured above, for example, covers the animals that live on land. The student spends an entire year studying just those kinds of animals. For some students, that is ideal. They love “diving into” one subject and studying it for a long time. My books follow history. Instead of concentrating on a subject, the books discuss science as it was discovered. This means you are always studying a different scientific topic, but you are actually seeing how it was figured out. For students who do not like concentrating on one thing for a long time, and for students who love history, my courses are more ideal. Second, Jeannie’s books are written like “living books.” They are designed for the family to sit together and read aloud. There are some hands-on activities, but they are not the focus of each book. In addition, some of those hands-on activities are long projects that might take several days to complete. My books, on the other hand, are focused on the hands-on activities. Every day you do science, you do something with your hands, and usually, the activity is short and to the point. As a result, there is less reading and more “doing” in my books. For some students, Jeannie’s approach is better. For others, my approach is better. Third, Jeannie’s books are free-flowing. Her lessons are each a chapter long, so families must decide where to start and stop each time they want to do science. There are reading schedules to help them make that decision, but in the end, it is something that has to be determined. In my books, the lessons are already determined. Each day you do science, you start at the beginning of the lesson, and you end when the lesson ends. There are 90 lessons in each book, 12 of which are “challenge lessons” that can be skipped. So when I talk with homeschooling parents about elementary science, I don’t just say, “You should use my courses.” I try to get to know what kind of children they have, and then I recommend what I think is best for them. Sometimes, it’s my books. Sometimes, it’s Jeannie’s books. Sometimes, it’s a completely different curriculum altogether. While I recommend a wide variety of curricula, the only ones I have written are the ones that have my name on the cover. We have used both in our previous private school and now homeschool settings. And I concur, both very different approaches, but both very good content. My girls seem to prefer your books, for the hands on aspect, and minimal reading each day. I personally love the chronological order of your books. Good Job to everyone!! I can see how the Fulbright books might be more conventional/practical for a traditional classroom/lecture type setting, though. And your books better for smaller groups that can be active and moving around more easily!! 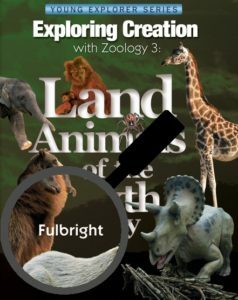 We’ve used several of yours and Jeannie Fulbright’s science books in our homeschool over the years, and for that I THANK YOU! What a blessing to us! Yes, a lot of reading in the upper levels, but also lots of hands on. (My boys have had plenty of lab experience!) I only wish I had discovered the Apologia series from the beginning. The year we started Apologia science I had one boy in Exploring Creation with General Science, and two in Flying Creatures of the Fifth Day. At one point my two younger boys were doing an experiment that involved making identical bird feeders (controlling variables), using different birdseed in them to see if the birds had a preference, and tracking their results. I was chatting with a neighbor and realized that her (public) high school daughter was doing the exact same experiment in Honors Biology. I was hooked 😀 I deeply appreciate your honest Christian perspective on science, and how you present it. Things are changing for the better, as far as finding resources that teach science from a Christian worldview that aren’t silly or cartoonish. Boy number one has graduated (AA) and is working. Boy number two is in college (currently taking Chemistry and getting an A), and the youngest is just about to finish your Biology course. Again, we really appreciate the courses. Too funny, Julie. I also have 3 sons, and we all think of Dr. Wile as their science teacher. Son #1 is getting a PHD in Physics and currently in Israel doing that. Son #2 will start graduate school for Chemistry soon. Son #3 has one year left in high school – likes science and math, but also plays the piano and organ. That’s just weird. I understand people may be confused that you’re no longer with Apologia. But, the elementary books didn’t have your name on them – we were never confused about that! I’m even thinking that the high school Marine Biology and maybe Human Anatomy/Advanced Biology were written by or with someone else. This is a well written explanation, Jay! Thanks for your kind words and for sharing this information with everyone. I know it will be very helpful. Homeschoolers today are blessed to have so many options for teaching science. I am grateful for your contribution to the homeschooling community.